You will be given a reference e-book to read which has 309 pages and the test will be based on that e-book , you can take final test within 1 year of purchase. ERP which stands for enterprise resource planning refers to the process of using effective systems to effectively integrate external and internal management information within a business organization while also embracing all aspects related to running a business including finance, manufacturing, accounting, customer relationship management, sales and service. Systems that are primarily designed for enterprise resource planning can also be expected to work in automating the whole process with the help of an effective integrated software application. One of the major objectives of enterprise resource planning is facilitating information flow between all major functions of your business within the organizational boundaries while making sure that connections outside stakeholders are effectively managed. What makes the systems for enterprise resource planning even more beneficial is their ability to run on various network configurations and computer hardware and typically employ database that can be expected to work as an effective repository for information. Experts also define enterprise resource planning as an effective software for business management which is a huge help in allowing organizations to take advantage of systems that come with integrated applications that you can use in managing all affairs of your business. Software designed for enterprise resource planning also works in integrating various facets of business operations including manufacturing, marketing, sales and development. 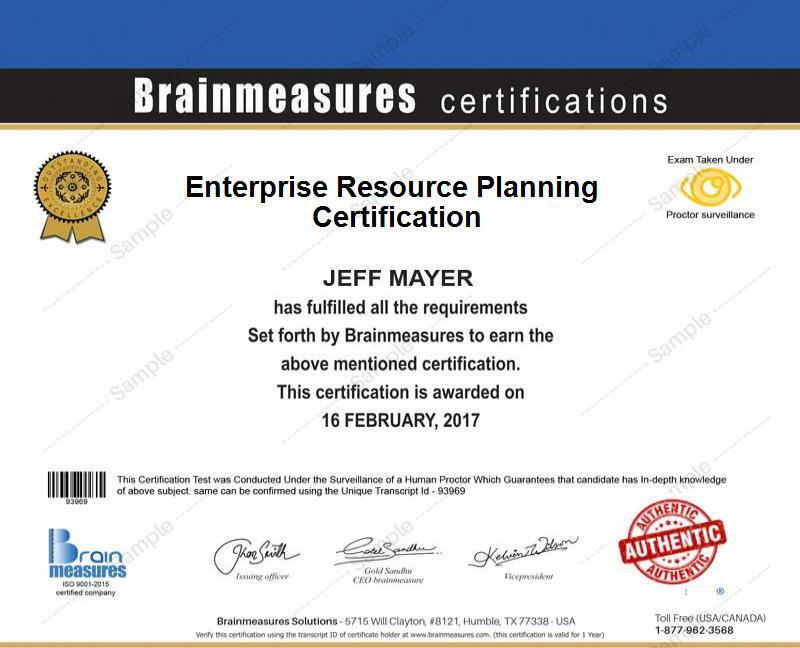 If becoming a certified enterprise resource planning expert is one of your major goals, then be aware that Brainmeasures can be your best ally with its ability to provide you with a highly comprehensive and detailed enterprise resource planning certification course. This enterprise resource planning course is one of the most impressive online certification courses provided by this reputable company because aside from simplifying the most complex concepts and aspects related to enterprise resource planning, experts who have developed this program make it a point to update information and make sure that all the details that form part of it are accurate. It allows you to enjoy a kind of enterprise resource planning training which is guaranteed to work in raising your awareness about the different systems that are now used in enterprise resource planning, the different facets that are covered by the whole process, the different tools and strategies that you can use in making ERP even more effective and the specific functions and benefits that you will enjoy from implementing it. Deciding to get your certificate from Brainmeasures is extremely beneficial because this company is already so popular in providing the best online certification courses to the public. How to assess the principles used by the Philippines in adopting ERP? How different ERP systems impact the effectiveness of business organizations? Brainmeasures enterprise resource planning certification program can be expected to work for a wide range of individuals and professionals especially those who are responsible in effectively running the daily operations of business organizations. You can expect this program to work suitably for all aspiring and existing IT executives, finance executives, managers, sales professionals, business managers, business owners and any other professionals who are tasked to reduce the risks associated to running a business and maximize its benefits through enterprise resource planning. Enterprise resource planning certification holders can also be expected to earn a more stable income. With an enterprise resource planning certification around, you can easily get the position of an enterprise resource planning manager and earn around $63,000 to $135,000 through this profession. Using your certification to become an enterprise resource planning developer is also beneficial because it allows you to enjoy around $78,000 to $153,000 per year.